Saturday was a sunny, but very cold day so I chose to stay in and do my very first SUDSOL design challenge. This week the challenge was to make an easel card - I had never seen one, but the sample they gave us looked like fun and the directions were pretty straight forward so thinking ahead to January club, I decided to jump in and give it a try. Of course, for January, I won't be using Delightful Decorations stamp set, but the easel will definately be in use. It's as easy as pie and looks great, so here's the one I made today. I can't wait to make more. This card when folded closed fits inside a A2 envelope - now that makes it unique, decorative and easy to mail. Supplies: Paper - Night of Navy, Whisper White, Bella Bleu DSP; Ink - VersaMark and Platinum Shimmer Paint; Pretties Kit for half pearls; Silver Embossing Powder; Ornament Punch; Delightful Decorations stamp set; Stampin' dimensionals and Snail adhesive. It's officially a record - the earliest we have ever had snow in the Houston, Texas area! Accumulation around my house didn't amount to much, except on bushes and trees, but the big fluffy flakes were a joy to watch. Here are just a few pictures and now you know why I had time yesterday to take part in a Chat & Challenge and get back to posting! Pencil cactus leaning on BBQ pit covered with snow and Papaya with fruit nearly ready to pick - had to go ahead to keep it from freezing - all of the leaves were droopy today and most of plant lost to cold temps! Rosemary plant covered with snow - really pretty, but today it's back to normal - no damage seen! Amazingly, the bouganvilla on the right covered with snow looks perfect today! Just never know - needless to say my tomatoes and peppers are gone! I just didn't even try to cover things - most are just too big and after all they belong to God not me - I knew some would survive and some wouldn't, but the garden will be new and fresh in the spring. A miracle of a day! It's been over a month since I've posted! It's been a busy time - we've been looking for a new house, I led a Beth Moore Bible Study, cooked dinner at our church for 45-50 people twice in November and planned and executed the church Thanksgiving Day Dinner with 40 in attendance and my daughter and grand-daughter were here for the Thanksgiving holidays. Now for the real reason I haven't posted - I just haven't sat down and done it! So here I am preparing to post - and watch out I've made a lot of cards so posts will be coming strong for a while! I also hadn't done even one Chat & Challenge with one of my online groups in a long time, so today I just said I'm going to do it and I did! This is the card I made using the fun stamp set Sparkly and Bright. Look at this card as a sketch and see if you can come up with a card using the same basic design. 1-1/4" and 1"; Stamp Set - Sparkly and Bright. I found these spiders in my yard - they are almost always white, but you can see one was bright orange! I could only wonder if it had ask itself - should I dress up as a ghost, no that's what I always look like - think I'll be a jack-o-lantern this year! Hope everyone has a sweet, but spooky holiday! Before I get too carried away with my Christmas cards, I wanted to share this adorable little double sided box I made for Halloween treats. 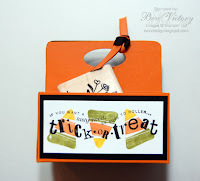 One one side there's a little bag of candy corn and the other a single stamp and black stampin' spot. I made this with the box #2 die (114518 - pg. 201). I cut two boxes - one basic black, one only orange and then without folding down the tops I glued them together. I punched a hole for the handle with the small oval punch(107304 pg. 186) and tied pieces of basic black and only orange 1/4 inch grosgrain ribbon for added decoration. 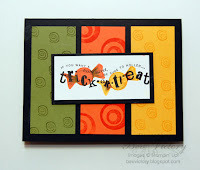 I stamped the front pieces using the candy corn and trick or treat stamps from the set Tasty Sweet. I made the filler using only orange and basic black scraps - running them through the crimper. I really love my Big Shot (pg. 194 - IBC) the boxes and other gift items are endless! If you don't have a demonstrator and are interested in information on the Big Shot, shoot me an email and we'll get you all set up. You will wonder how you ever crafted without it! 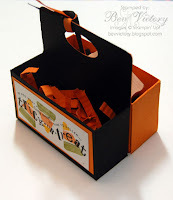 Supplies: Paper - Basic Black, Only Orange, Whisper White; Big Shot and #2 Box Die; Small Oval Punch; Ribbon - Only Orange & Basic Black 1/4" grosgrain; Stamp Set - Tasty Sweet. Six of us have met every month to make Christmas cards (there have been a few exceptions due to illness, travel or work), but most have been able to be faithful every month and I was posting my cards here every month, but have fallen way behind - so this week I will try to catch up. This is one of my favorites (the next one will be one of my favorites too, LOL) - hope you enjoy it! I am posting the front and two other views so you can see how it folds. I love this card and you will see one more in another day or two! I love making this trifold card. I used the flocked design from the Christmas Cocoa Specialty paper - you can see all of the available designs on page 21 of the holiday mini catalog. 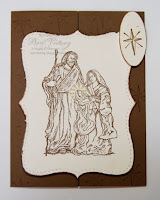 The stamp set is one of my favorites Christ is Born, pg. 37 in the 2009-2010 IBC. I know I've been out of pocket for some time, but I just bet you didn't know it was Papaya season! Yes, I've been out in my yard harvesting papaya - wish you were here to share! It's been a bumper crop for sure, I even needed a ladder to reach them all! Ok, ok, I get it! I have lots of friends with leaves and I have been given lots of invitations to come help rake leaves. LOL I don't think I meant to say I missed raking, I meant to say I miss jumping into them and I miss the season! And don't think I'm getting out of work, I get to mow grass all year long, sort of makes up for that lack of raking thing. So thanks for the invites, but I'll pass this year. Actually, we're headed to Kentucky the end of October and I look forward to seeing some beautiful trees between here and there (we're driving). Now on to the cards! I told you I made lots of these cards and so here are a few more of them! Tomorrow when I post my "last" of this club series, you will see one made a little differently, but these are just like yesterday. 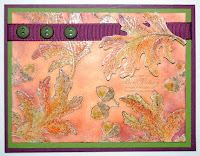 Again, these are the ones where I embossed the leaves completely before sponging the background. And now here it is with three buttons - makes a big difference. It could still use some more, so don't be surprised if you see it again - as Gretchen would say - "taken to the top." See you tomorrow. Happy Stampin'! Living where I do autumn leaves actually arrive in November around Thanksgiving and last through early December. They are pretty, but more yellows than the reds I group up with in Missouri. I still love the fall (we actually don't have one here) and I miss the smell of the leaves, the raking of the big piles and the jumping into the middle of them. Now actually, I don't think I would jump into the middle of them today, but I can tell you that just seeing brightly colored leaves brings back wonderful memories. I saw a card similar to this one and new I had to make it. 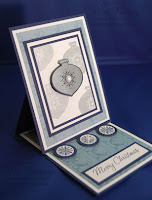 Check out my inspiration, Laura Lipe (click here)We actually made this card at our monthly club gatherings this month and by the time I had demoed for two different groups and made my samples I have a nice grouping to send out to my friends and famly. This is just one of many different looks, because the best part is just like real leaves each card has it's own look. I embossed the leaves on whisper white paper using soft suede and versa mark, with clear embossing powder. 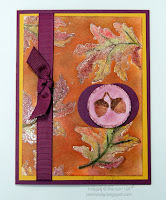 Colored in the leaves using a variety of stamp pads and blender pens. 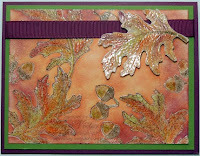 Covered the leaves completely using the versamark pen and embossed with clear embossing powder. We then sponged the background with three or four different inks and sponge daubers, wiping the leaves off when we were finished. The card base is Rich Razzleberry, second layer is Crushed Curry. 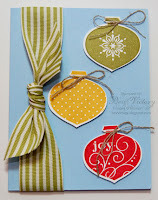 I used Rich Razzleberry Ribbon - ribbon is polka dot, but you can flip it over and have a solid color. 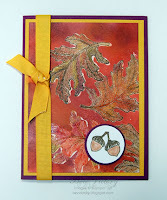 I stamped the cute little acorns with versamark and soft suede and colored in with blender pens, finishing by sponging the back ground. I punched them out with the 1 3/8 punch and two punches the same size with the Rich Razzlebery to add still another layer. Like I said I have a number of these cards and will be posting them over the next few days. It sounds much more complicated than it is - so if you have this set - get out your inks and have fun! If you don't have this set and don't have a current demo, I will be happy to help you place an order - directly with me or using my online store. 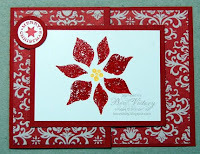 Happy Stampin' - See you tomorrow. Now on to the card(s) - I am casing a card that I got while attending regionals last year in San Antonio, made by Tameria Lindley. I've held on to the card because I thought it was so well done. I've done two versions - one with candy corn and and one with the stamp that looks like hard candy, wrapped in cellophane. I love both cards - hope you do to. I used Basic Black, Summer Sun, Old Olive, Only Orange and Whisper White. I colored the candies with markers and the Trick or Treat with Basic Black. It's not to early to start your cards, pull out your paper and stamps and have fun. It will help if you surround yourself with your favorite candy! I promise, it really will. See you tomorrow with the some autumn leaves. 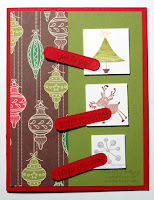 I love this simple little project featured on the Stampin' Up Customer Website this month. We made these at our September club - using the Halloween Hoot and Autumn Harvest stamp sets and Happy Thanksgiving from Teeny Tiny Wishes! All of them hold a minature candy bar - a cute little treat for your coworkers desk! Don't know about you but I love the little toad offering "free kisses". Oh, yes, like there's anything free. LOL If you need the pattern for this little box let me know and I will send it to you. These are cute, fast and fun! More from our September club soon! I promise, soon! I know it's been over a week, but I promise it won't be that long before my next post. In fact, I'll see you tomorrow. My Digital Studio is here! I know I haven't posted in several days, but I have a good excuse, no a great excuse. September 1 was the first day we could order our copy of My Digital Studio (demos only - customers October 1) and, of course, I got mine ordered immediately. It's here and I love it!!!!! 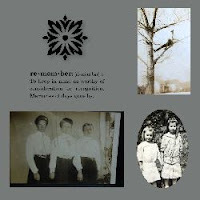 I have thousands of pictures and I have always wanted to make scrapbooks, but just couldn't seem to get it together except on very small ones - well those days are over. With no training, I loaded the program and started to work. This was my first page - I can't tell you how quick this was to do. The color of the mats is none other than Baja Breeze! Yes, they have last year's In Colors available for scrapping. 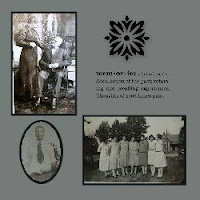 My next pages were two I did of old pictures of my mom and her parents, brother and six sisters. 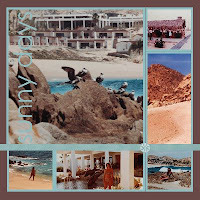 I scanned old pictures in over a year ago, but just hadn't found time to do a scrapbook. Now I have two pages done! I'm telling you, this programs is awesome. All of our color families are available in paper and many fabulous stamps. Yes, you will find buttons, brads, ribbons and oh so much more! 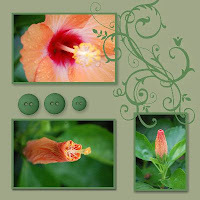 Now my last page features a hibiscus in my garden. I love it because it's the beginning, the middle and the end of a flower's life span. Don't you just love the buttons (we can make them any size) and the swirly is a stamp Baroque Motifs - flourish! Now, that's it for tonight and maybe for a couple of days. Stamp Club is this week and I must come up with projects and have them ready to go - sounds easy, except tomorrow is a holiday and I have my hubby at home (cuts down on stamping time), so I'll probably be back on Wednesday with samples from Tuesday night. It won't be easy to leave my MDS alone, but I'll try. Hope everyone has a wonderful day tomorrow - don't forget to labor! Holiday Mini Catalog - Shop it now! There are so many fun stamp sets, specialty papers, new dies and embosslits for your Big Shot, rubons and the "Build-a-Bear" dies and stamps in this Holiday mini catalog! I made this card for the weekend workshop using the new Delightful Decorations - the possibilities are unlimited - check it out today, by clicking on the image in the left sidebar! If you are one of my customers, your catalog has been mailed, but there was a delay at the mailhouse so it may just be arriving. I promise it will be worth the wait! Be sure and check out the hostess special regarding the mini - also in the left sidebar! I love this stamp set - we made this card at a workshop last Saturday. I got the idea from a card swap at the San Antonio Regional last fall. It was made by Samantha Robertson and I thank her for her inspiration. If you would like to have a workshop and make some fun cards with your friends and earn some a free hostess set and some "SU Bucks" give me a call and let's get one on the fall schedule. If you don't have this set, check it out on page 55 of the IBC - I think you just might want to add it to your wish list! Just looked at my Sunday post and saw I had the same picture in twice! Oops - please check it again and you will find the card with the circle cut is now where it belongs. I would like to mention again that this circle was so easy with the clear circle die. I expected to use this more with scrapbooking to help line up the part of a picture I would want to cut out, but it also allows you to stamp your image and then punch without worrying about your being sraight or fitting inside the circle. On the downside, it is a large circle for many card designs. 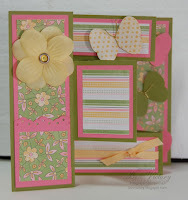 I recently saw a gate fold card on one of my many favorite blogs and decided to give it a try. 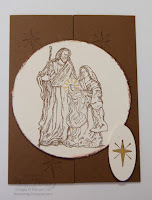 I decided to use my new Holy Family stamp set from the new mini catalog. This stamp set will be available for purchase September 1, along with many other exciting new stamps, accessories and our new Build A Bear line, but today I featue the Holy Family. 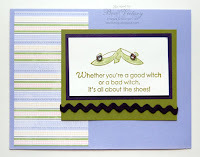 This is such a simple card to make, with a simple look, but I love it! I've decided to add this to my Christmas cards for this year. I used our new In Color Soft Suede and Very Vanilla for a simple, but beautiful design. The only other color is the gold in the star and around Baby Jesus head. I stamped the design and then cut it out using the clear circle die and the Big Shot. I used the cutter kit to rough up the edges and then sponged them with the Soft Suede ink. I, also, stamped the star image with the Soft Suede ink on the background. The second card, is exacctly the same except I stamped the main image on Very Vanilla paper cut out with the Top Note die. 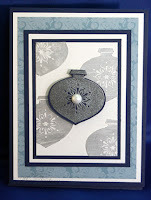 I stamped the star and punched it out with the large oval punch to hold the card closed. Again this is a simple card, but beautiful in it's simplicity. Your turn, get out your paper and make one of these simple cards. I titled this blog post tri-shutter card #2, but actually this is the first one I made. I'm posting it later because it was a birthday card and I wanted to be sure it had been opened before I posted it to my blog. As I told you yesterday I got the idea from Dayanna Donng when I saw it on her blog, but when I looked for instructions I found the layout for this one. I wanted to make a very special birthday card and so I jumped off the cliff and tried what I thought would be a very difficult card to make. Like I said yesterday, much to my surprise it looks much more difficult than it is. I was so new to this card that I didn't stop and see the difference in size in the panels until I was finished with the card and starting to put on the embellishments! Both cards are fun to make and although they're very different in looks I think they both are beautiful cards. I know this is the just the first of many of these cards. I already have my eye on a new paper for a sophisticated card, but for now we will wait until my next order. Thank God September is just around the corner as I've met my limit for August! LOL Stop laughing - I have a limit! Honest, I really do. I used Tea Party DSP for this card, the flower is from the Pretties Kit (colored with Barely Banana marker), the butterflies were made with our wonderful and exclusive to Stampin' Up! butterfly punch and one of my favorite stamps from On Your Birthday - Live, Laugh & Love! Hope you enjoy the card and I hope Sarah had a wonderful birthday!